This past summer, thousands of children attended Mighty Fortress VBS and heard the good news that in Jesus the victory is won! Indeed, Christ’s death and resurrection won salvation for all who believe—from every tribe, nation, and language. That's why CPH’s Spanish division, Editorial Concordia, has equipped Hispanics with ministry materials in their own language for nearly three decades, including a full-fledged Spanish VBS curriculum each year. Originally written in Spanish by an experienced team of teachers, the easy and economical Spanish VBS materials serve the Church throughout Latin America and equip mission teams from across the United States. The 2017 Spanish theme was Jesus Encounters. 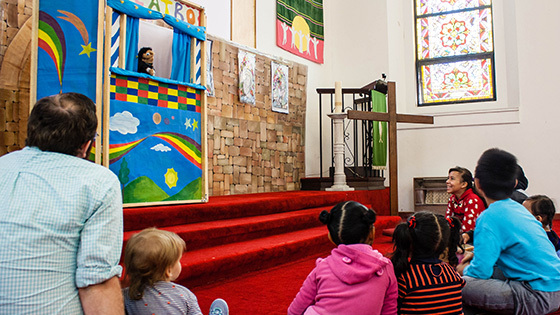 At this VBS, participants joined young Martín to sit at the Savior’s feet and saw how He blessed, healed, sought, and saved His people in the Bible and does the same for us. A mission in rural Mexico used donated VBS materials to hold classes outdoors under a tree. The majority of the children couldn’t read or write but savored the opportunity to learn about their Savior. After holding their own VBS, eight church leaders from another recipient of donated materials left on a mission trip, driving seven and a half hours and enduring car trouble along the way to share Christ with forty-five children. Next year, Editorial Concordia turns to the Old Testament Book of Daniel with five stories that show how God is ever present in the lives of His faithful people, protecting them and working for their good. Get ready for Sucedió en Babilonia (It Happened in Babylon) in January 2018! For more information on CPH’s Spanish and bilingual VBS, including samples, tips, and freebies, visit cph.org/spanishvbs.